Location, portrait and event shooters will rejoice at the ease and portability of this self-contained Studio Assets PXB Portable X-frame Background System (8x8 ft.). 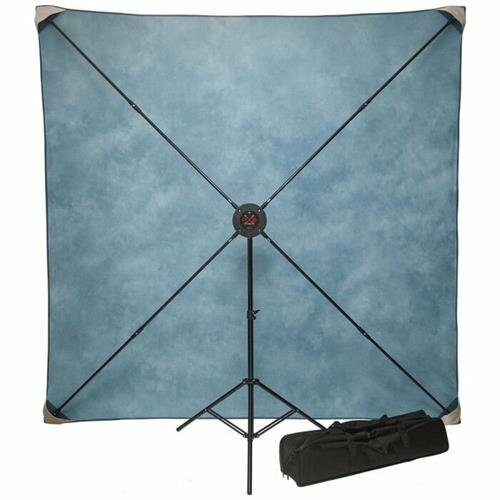 The PXB Pro Portable Background System consists of a unique X-frame and a convenient adjustable stand. It assembles in minutes, is completely self-supporting and stows away neatly in its own 8 x 8 x 36 inches (20 x 20 x 92 cm) case and weighs just 11.8 lbs. (5.4 kg). The new fiberglass resin rods are durable and lightweight, making the PXB Pro 1 lbs. lighter than the previous version. At the end of each rod is a quick connector that holds the rods together even when muslin isn't mounted. The PXB Pro also features a brand new durable metal alloy center hub. The PXB Pro features a new expandable connector system.Features: Great for both studio and location workMade of best quality modular designAssembles in minutesCompletely self-supportingPlease Note: Fabrics are Sold Separately.